Mammal migration between seasonal ranges can consist of relatively short distance migrations of a single individual as well as massive migrations involving thousands of individuals in a population. Understanding the varying migratory habits among species requires detailed information of specific routes and stopover sites. Studying and preserving this behavior is vital but challenging, as both natural and anthropogenic threats exist to migrants. Disjointed management prevents comprehensive solutions from being implemented to protect migratory species in North America. Additional research that takes into consideration all factors of migration and accounts for the uniqueness of animal movement patterns is essential for developing and executing conservation strategies that can prevent further extinction or endangerment of migratory behaviors. 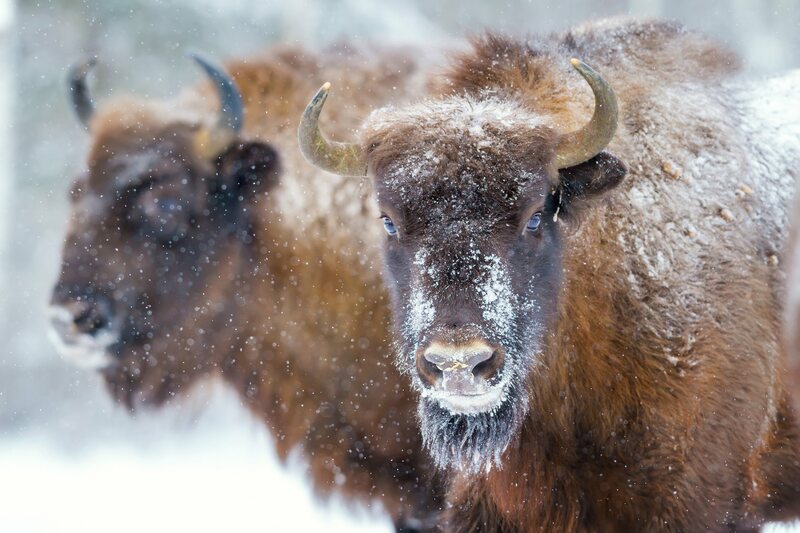 North American Bison undergo a significant annual migration, although 75% of their traditional migratory routes are now gone or imperiled. Most animal migrations occur when migrants respond to the seasonal shifting in resource availability; this seasonal round-trip movement is often used as a defining characteristic to determine which movements are considered migrations (Harris, Thirgood, Hopcraft, Cromsight, & Berger, 2009, p. 55; Berger, 2004, p. 321). Long distance migration can be more problematic to define. Berger (2004, p. 321) notes that although the different life histories of certain species can make it difficult to determine which migrations should be considered long distance, conservation approaches should be more concerned with absolute distances traveled as they do not need to take into account animal size. Considering this, many researchers define long distance migration as any regular one way movement that exceeds 10-12 km (Berger, 2004, p. 322). However, there is disagreement as to this proposed definition. Berger (2004, p. 322) suggests that conservation approaches will require consideration of individual species and populations. Therefore, they do not require a strict adherence to a particular definition of long distance migration; but simply an understanding of regular seasonal migration that needs to be protected (Berger, 2004, p. 322). Climate change presents a unique component to the discussion of migration conservation. Changing environments can greatly impact migrating species. The unpredictability of such changes makes planning especially difficult, particularly throughout a range of environments that a single species may travel through. Protective measures are vital for migrations. Mass migrations for six species globally are already extinct or unknown (Harris, et al., 2009, p. 55). North America is home to several of the remaining mass migrations, including that of caribou (Rangifer tarandus), elk (Cervus elaphus), bison (Bison bison), and pronghorn (Antilocapra americana) (Berger, 2004, p. 320; Harris, et al., 2009, p. 55). Smaller, but still vital, mammal migrations also occur in North America. One such example is mule deer (Odocoileus hemionus) in western North America (Sawyer, et al., 2009, p. 2016). In addition, species often unassociated with migration still engage in migratory behavior and require consideration. Asocial migrators include black-tailed jackrabbits (Lepus californicus) and boreal moose (Alces alces), which travel distances of up to 390 km round-trip (Berger, 2004, p. 321). The lack of detailed information regarding migratory habits creates concerns about the ability to generate effective management strategies. One specific concern is the lack of understanding of migratory routes themselves and the landscapes being utilized by migrators. Understanding the causes and consequences of movement patterns provides additional information on population distribution, resource use, dispersal strategies, social interactions, and use of space that is valuable to conservation efforts (Horne, Garton, Krone, & Lewis, 2007, p. 2354). Animal movement is defined as “a continuous trajectory or path through space and time” (Horne, et al., 2007, p. 2354). While direct observation is the best method for obtaining movement data, not all animals are able to be continuously monitored (Horne, et al., 2007, p. 2354). This is particularly true for large scale mammal migrations where movement patterns take place over extended periods of time, over extensive distances, and in large groupings of individuals. Biotelemetry data, particularly with the use of global positioning system (GPS) telemetry, enables researchers to obtain location data regarding animal movements when direct observation is not feasible (Horne, et al., 2007, p. 2354). The advantages with GPS are numerous, and this data is useful in several different models for evaluating movement patterns. Building landscape models to assist managers in the past has relied heavily on spatial data from polygon vectors or raster grids (Bunn, Urban, & Keitt, 2000, p. 265). Applying graph theory to conservation biology can improve the understanding of landscape connectivity (Bunn, et al., 2000, p. 265). Although used by Bunn and coauthors (2000) to explore landscape connectivity in non-migratory populations, graph theory could be expanded upon to be used for migratory species as well. Graph theory enables managers to focus less on large biogeographic areas and more on small, more specific locations within the larger areas that are being utilized (Bunn, et al., 2000, p. 265). As Bunn and coauthors (2000, p. 265) note, focusing on both large spatial data and large biogeographic areas in conservation biology can be limiting because of landscape heterogeneity. Utilizing graph theory, Bunn and coauthors (2000) evaluated individual dispersal to determine primary habitat and non-habitat areas for specific species. They were able to evaluate resource strength, long distance traversability, functional distance between habitat patches, and least-cost mortality paths (Bunn, et al., 2000, p. 266). A similar approach would be beneficial to obtaining a deeper understanding of specific migratory routes and the most valuable locations to migrators along those routes. The Brownian bridge movement model (BBMM) allows another avenue for exploring the expected movement of animal migrations by utilizing location data obtained at short time intervals (Horne, et al., 2007, p. 2354). BBMM employs information from successive locations, the time between locations, the distance between locations, and motion variance to determine a conditional random walk to aid in the understanding of movement patterns (Horne, et al., 2007, p. 2354). Utilizing chest height and snow depth data, Berger (2004, p. 323) was able to determine a winter occurrence prediction for pronghorn, bison, and elk. Bighorn sheep (Ovis canadensis), moose, mule deer, and elk migrate between 50 and 100 km between seasonal sites across the Intermountain West, migrating from low elevation sites in winter to higher elevation sites in summer (Sawyer, Kauffman, Nielson, & Horne, 2009, p. 2016). This migratory pattern allows them to access higher quality forage that is needed during breeding periods (Sawyer, et al., 2009, p. 2016). The pronghorn, which migrate round-trip up to 550 km annually, is the only surviving widespread ungulate still in North America (Berger, 2004, p. 320). Barren-ground caribou can have incredible long distance migrations, the longest being 2500 km (Berger, 2004, p. 323). Woodland caribou are more conservative in their migrations by comparison (Berger, 2004, p. 323). Black-tailed jackrabbits are on the smaller end of the migration spectrum, typically traveling less than 12km (Berger, 2004, p. 323). Mule deer average migration distances of 66km, but this can vary significantly depending on location (Berger, 2004, p. 323). For example, mule deer in the Upper Green River Basin of Wyoming exceed travel distances of 285km (Berger, 2004, p. 323). During migration, mule deer utilize specific high resource sites where they spend the majority of their time along their route, as well as the corridors that connect these sites and allow the deer quick access between specific locations (Sawyer, et al., 2009, p. 2016). Protecting the migratory routes for North American mammals is vital. Although under-researched, the connection between ungulate migrations and ecosystems suggests that ungulate grazing can have a great impact on ecosystems (Bolger, Newmark, Morrison, & Doak, 2007, p. 63). This makes the protection of ungulate migrations valuable for the ecosystems they inhabit and travel through. Challenges abound in protecting these migrations. Migrants often utilize narrow corridors that are only 0.1-0.8km wide (Berger, 2004, p. 320). These corridors have often been utilized historically and have existed for as long as 5800 years (Berger, 2004, p. 320). North American migrants often travel great distances, exceeding that of other global mammal migrations with possibly thousands of individuals moving together (Berger, 2004, p. 320; Bolger, et al., 2007, p. 63). Although some approaches deal with basic accommodations for these paths, they often fail as they assume animal movement is in a straight line. Unfortunately, animal movements do not occur in a straight line. Their more circuitous routes necessitate a different approach to delineating these migratory corridors (Bunn, et al., 2000, p. 275). The ease of overlooking smaller migrations means many are quickly lost due to a lack of protections from conservation managers (Harris, 2009, p. 55). Landscape use poses another factor in conservation planning. The variance in biological value of a particular area makes reserve placement difficult (Berger, 2004, p. 321). In addition, events that happen beyond the borders of established reserves can still have impacts on the reserve habitat, which is something that managers are often unable to account for or mitigate (Berger, 2004, p. 321). Climate change presents a unique component to the discussion of migration conservation. Changing environments can greatly impact migrating species. The unpredictability of such changes makes planning especially difficult, particularly throughout a range of environments that a single species may travel through (Berger, 2004, p. 321). The wide variety of threats to massive migrations is an additional challenge. Bolger and coauthors (2007, p. 63) commented that ecological factors such as resource variation and predation were the primary focus of research regarding favorable migratory conditions. However, recent research has looked more closely at the anthropogenic factors that create challenges for massive migrations. The high level of human impacts on migrations creates an additional set of challenges for the conservation of terrestrial migrations. Some of the most significant threats to North American populations include livestock, agriculture, fencing, roads, and other anthropogenic barriers that prevent or limit access to forage or water along migratory routes (Harris, et al., 2009, p. 55; Bolger, et al., 2007, p. 63). Additional land leasing for energy development plans is likely to contribute to the reduction or extinction of migrations (Berger, 2004, p. 320). In southwest Wyoming for example, 2000 gas wells requiring 1609km of pipelines and road access have been proposed for energy development that will impact migratory routes of species such as mule deer (Sawyer, et al., 2009, p. 2016). In the Gallatin Valley of Montana, elk once crossed the valley as part of their migratory routes, but due to the human population of over 40,000, are no longer able to do so (Berger, 2004, p. 323). Overhunting, habitat loss, and fragmentation have also seriously disrupted migrations (Bolger, et al., 2007, p. 63; Sawyer, et al., 2009, p. 2016). Disrupting migratory routes not only impacts the value of such historical migrations, but can also contribute to rapid population collapse in some species (Bolger, et al., 2007, p. 63). The increasing rareness of large-scale mammal migratory events has prompted researchers to develop suggestions for retaining such occurrences. One often suggested plan is to protect specific sites that are considered to be of particular importance to migratory species along their routes (Berger, 2004, p. 320). Harris and coauthors (2009, p. 55) outline several important strategies for protecting migrants, including securing seasonal ranges, protecting resources, implementing governmental support, and minimizing fences and other obstructions. One location that is considered to be of significant importance to North American migrating mammals is the Greater Yellowstone region; many of these strategies have been implemented to some extent within this area already. Despite this, approximately 75% of the migratory routes are gone for elk, bison, and pronghorn within and near this region (Berger, 2004, p. 320). Another common suggestion is to provide specific protection in the form of establishing a national migration corridor network, focusing on the Yellowstone region, to provide protections for multiple species that would be able to utilize such corridors (Berger, 2004, p. 320). However, as different species will utilize different corridors along their route, such an objective seems unlikely to occur in the face of development. Instead, the only viable option is to protect the highest trafficked corridors for maximum migration retainment with the understanding that certain migrations will be lost or truncated due to human development. Some authors suggest separate approaches for conserving stopover sites and corridors (Sawyer, et al., 2009, p. 2016), and while this does appear logical, there are some concerns with such a suggestion. Inadequate protections for either specific high resource sites or corridors can hinder migrations. While much of the literature suggests strategies that do incorporate protections of both, oftentimes measures for protecting corridors are not nearly as efficient as protecting specific stopover points along migratory routes. In addition, many suggestions that address the protection of corridors do so in too simple a manner as routes are rarely in an easily mapped straight line but rather have natural deviations that are not detected effectively given current knowledge of migration routes. Migration conservation requires an understanding of more than the human impact on migration stopover sites or corridors. The complexity of such a behavior requires a comprehensive understanding of population dynamics, evolution, genetics, behavior, and physiology (Bolger, et al., 2007, p. 63). In addition, observing the migratory patterns of non-mammalian taxa can add further insight into mammal migrations and the steps required for protecting them (Bolger, et al., 2007, p. 63). At this point, not enough information is available regarding the biology behind migration for many mammal species (Bolger, et al., 2007, p. 63). While much research has been done on the many anthropogenic factors that hinder large mammal migrations, little in the way of policy recommendation has been made from this research. The focus seems to have been on the multiple ways of improving the understanding of migratory routes in order to protect specific sites. While this is of course a worthy objective, specific action plans must also be included to assist managers in determining specific avenues for the conservation of migratory species and their migration habits. Berger, J. (2004). The Last Mile: How to Sustain Long-Distance Migration in Mammals. Conservation Biology, 18, 320-331. Harris, G., Thirgood, S., Hopcraft, J., Cromsight, J., & Berger, J. (2009). Global decline in aggregated migrations of large terrestrial mammals. Endangered Species Research, 7, 55-76. Horne, J., Garton, E., Krone, S., & Lewis, J. (2007). Analyzing Animal Movements Using Brownian Bridges. Ecology, 2354-2363. Sawyer, H., Kauffman, M., Nielson, R., & Horne, J. (2009). Identifying and prioritizing ungulate migration routes for landscape-level conservation. Ecological Applications, 2016-2025.